Vibratory feeder bowl linings greatly reduce wear and expenses. Automation Devices, Inc. (ADI) is constantly evaluating new vibratory feeder bowl lining options. 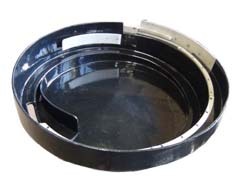 Some offer noise reduction and all offer some level of feeder bowl surface protection. Often part feed rates improve. See the chart below for general recommendations on various feeder bowl linings, along with their characteristics. Vibratory bowl linings reduce the noise emission of vibratory feeder bowls by providing a cushion between the part and the bowl, and by lessening the bowl's surface noise radiation characteristics. Surface preparation prior to coating is important for good bonding. For some linings, cleaning and roughening is adequate; on others, chemical preparation or priming is required. 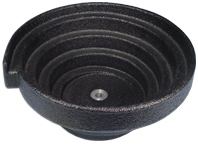 Abcite feeder bowl linings have exceptional dampening properties. They provide a cushion between the parts in the bowl and the bowl itself (the primary source of feeder noise). Also, abcite substantially reduces noise radiation from the feeder bowl interior and exterior surfaces (the secondary major noise emission source). Line-X® demonstrates excellent wear properties in abrasive applications such as large screw and stud applications and powdered metal products among many others. ADI can re-line your feeder bowl with quick turnaround times. We strive to reduce production line downtime as well increase the durability of your vibratory feeding equipment. 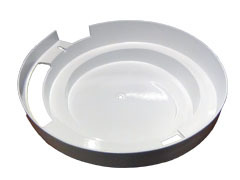 Other feeder bowl linings are available including Teflon, carbide tungsten, absynthe, Surlyn and polyester. Custom coatings and paints are available for all equipment. 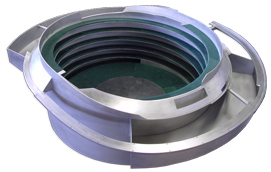 Contact Automation Devices, Inc. for more information about our vibratory feeder bowl lining services.